PORTLAND, Oregon – OHSU will become a national center for an imaging technique that is revolutionizing structural biology. In partnership with the Pacific Northwest National Laboratory, OHSU becomes one of three national centers established by the National Institutes of Health in cryo-electron microscopy, or cryo-EM. The others are located at the New York Structural Biology Center in Manhattan and at Stanford University. The NIH is investing $128 million to establish all three centers and expand the use of this Nobel Prize-winning method of imaging. The NIH is putting an additional $1.5 million toward training users. "This puts OHSU on the map as a major player and participant in the national electron microscopy scene," said Eric Gouaux, Ph.D., investigator with the Howard Hughes Medical Institute and a senior scientist in the OHSU Vollum Institute. Gouaux is one of three principal investigators designated for the center at OHSU, along with Michael Chapman, Ph.D., professor of biochemistry and molecular biology in the OHSU School of Medicine, and James Evans, Ph.D., senior research scientist at the Pacific Northwest National Laboratory in Richland, Washington. 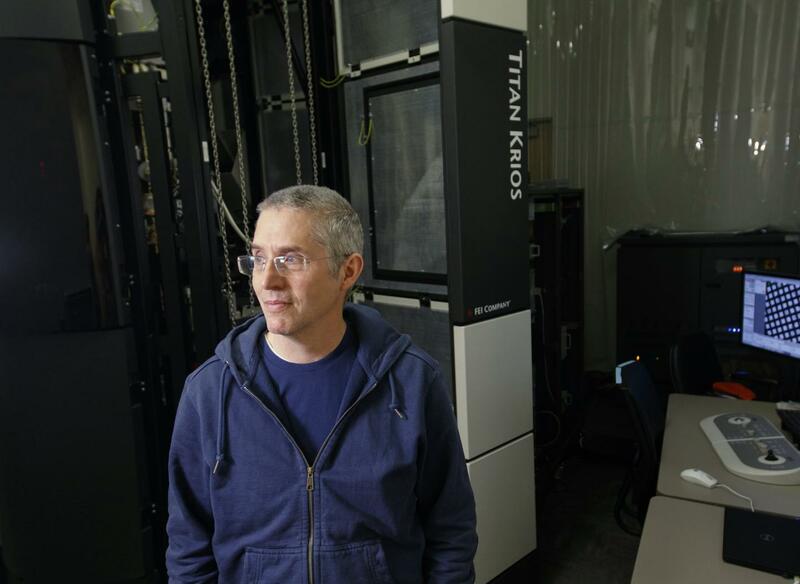 The new Pacific Northwest Center for Cryo-EM will add four powerful microscopes to OHSU's campus and will be jointly staffed by scientists from OHSU and PNNL. The new center will be co-located with the cryo-EM facility in the OHSU Center for Spatial Systems Biomedicine initially established by Joe Gray, Ph.D., professor of biomedical engineering, with support from the OHSU Knight Cancer Institute and made available to OHSU investigators through the Multiscale Microscopy Core. The new center, slated to open in October 2018, will begin installing new cryo-EM instruments later this year in the Robertson Collaborative Life Sciences Building on OHSU's South Waterfront Campus. "This powerful technology allows scientists to see molecules in breathtaking detail," said OHSU President Joe Robertson, M.D., M.B.A. "We're delighted that NIH is making this investment to make the technology more accessible to researchers. We are also gratified by the NIH's decision to establish a hub at OHSU for scientists from around the country seeking to understand disease at the molecular level and ultimately use that knowledge to improve human health." Each of the three NIH centers will provide scientists across the nation with access to state-of-the-art technology and training, from sample preparation to microscope data collection and computational analysis. The joint collaboration between OHSU and PNNL was a strong factor in realization of the new award. "Merging the existing strengths and expertise at both institutions will allow us to create a unique center and user experience streamlined for high-resolution structural analysis of isolated macromolecules and intact cells," Evans said. Cryo-EM produces extremely detailed three-dimensional images of cells. How detailed? "We use the term 'near-atomic' in describing the resolution," Chapman explained. "We can see where the atoms are in the protein." Given the excitement around the technique, Chapman also noted that "scientists will come here from the entire nation to work on different types of proteins." As the technology continues to improve, scientists expect they'll get ever more detailed images of DNA, RNA, proteins, viruses and cells, revealing how they change shape and interact as they carry out the functions of life. Gouaux expects that researchers will be able to produce images of the cell's molecular complexes quickly, efficiently and in their natural state. That's in contrast to X-ray crystallography, the previous state-of-the-art technology in which billions of molecules had to be organized into crystals in order to get an image. "There's been this enormous revolution," Gouaux said. "It's analogous to going from film cameras to digital." Electron microscopy works similarly to ordinary microscopy, except that a beam of electrons is sent through the sample instead of visible light. Because electrons have a much shorter wavelength than visible light, they can resolve molecular structures at an atomic scale. Fostered by the efforts of a trio of researchers who earned the Nobel Prize in Chemistry in 2017, the technology has in recent years matured to the point that scientists can now ascertain the form and function of molecules with striking detail. "Ten years ago, you would have seen the general areas where the proteins were as blobs on a screen," Chapman said. "Now we're able to see the atoms within those blobs." The NIH is establishing the centers to expand the work of scientists using cryo-EM to study biological molecules and, ultimately, the organization of these molecules within cells. Gouaux, for example, has established an international reputation for his work to improve basic understanding of the molecular structure and function of proteins that regulate communication between neurons in the brain, including the receptor involved in memory and learning, and the targets of therapeutic agents for Alzheimer's and Parkinson's diseases, as well as for schizophrenia and depression. Many of his previous breakthroughs involved the use of X-ray crystallography. He's now a convert to cryo-EM because of the technology's unique ability to see how large networks of molecules are organized in fine detail. Gouaux and other researchers expect the technology will greatly accelerate the ability of researchers to develop effective treatments for a wide variety of conditions. "Neuromodulators are the targets of many drugs," Gouaux said. "So understanding how they work will give us clues about how to build better ones." This work is supported by funding from the National Institutes of Health's Common Fund and administered by the National Institute of General Medical Sciences under Award Number U24GM129547.